Client: JBR Capital, a financing firm that specialises in arranging finance for high-end prestige cars. 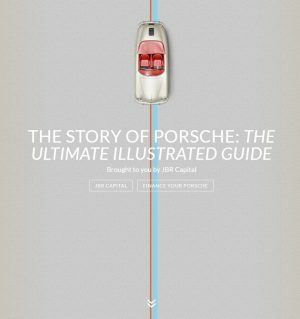 Content: The Story of Porsche, an illustrated guide to the celebrated German car brand. The aim of the content was to improve topical SEO authority on Porsche by creating and outreaching this guide to the company’s history. A range of Porsche guides already existed online, but most were insubstantial and lacked a visual impact. I researched and planned the contents of the guide before liaising with a specialist car journalist who provided the copy. I then outreached the guide to relevant websites including Porsche enthusiasts, car museum websites and general car bloggers. Results: 21 backlinks from highly relevant sites, as well as growth in email subscribers from PDF downloads of the guide.